Dairy Queen's Free Cone Day! – Dairy Queen Corp. Dairy Queen's Free Cone Day! Mark your calendars – Dairy Queen’s Free Cone Day is Monday, March 20. Participating Dairy Queen locations will be giving out free small vanilla cones this day. With a $1 to Children’s Miracle Network Hospitals, each fan can have their free cone dipped in chocolate. Participating locations in the following counties will benefit Johns Hopkins All Children’s Hospital – Citrus, Hernando, Pasco, Hillsborough, Pinellas, Polk, Manatee, Hardee, Highlands, Sarasota, De Soto, Glades, Charlotte, Lee, Hendry and Collier. Comments for Dairy Queen's Free Cone Day! Nothing is ever available in my area!!!!! 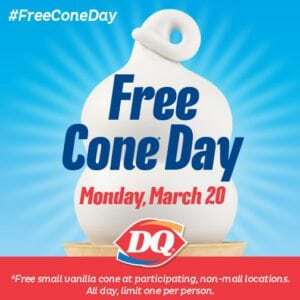 Next post: Today is Free Cone Day at Dairy Queen!